Blackbay Asylum. Created by Sweden based developer TAD Productions AB, this is their front running game and what a way to start it off! The story has been inspired by H.P Lovecraft who is the inspirational mind behind such things as The Call of Cthulhu, which has spouted its own table top RPG, and The Shadow Out of Time. The character you play is Doug Dunheiw who wakes up one day to find that he can leave his cell for an unknown reason and must embark on a horrific adventure to escape with his life! The thing that grabs you from the get go with this game is the tutorial, it is done using a simple leaflet left in Doug’s cell which gives you some background on the Asylum and the rules the inmates must abide by, on the back page however it gives you the basic controls for the game and believe us the space bar is going to get a lot of use here! 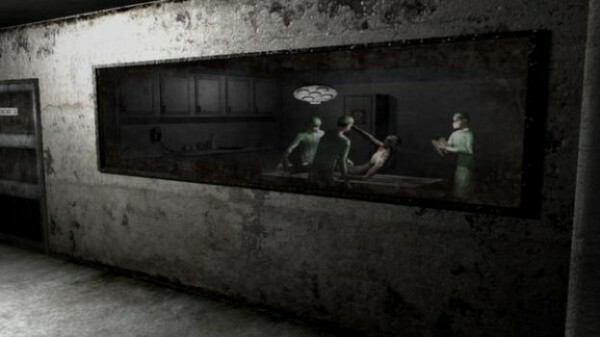 You are alone in the asylum and all you see is broken walls and dead bodies and a lot of blood and this can quite horrific because even though the game isn’t the most graphical thing your imagination fills in the gaps. The gameplay is easy, maybe a bit too easy for the first level, if you can make sense of it then you can get through within 10 minutes which was slightly disappointing. However upon further inspection this was probably designed that way to bring people into the game a lot more. The puzzles in the first level aren’t too difficult and they get you really immersed in the game and also makes you feel more intelligent than when you started. This is quickly dropper when you hit the second level because the puzzles just get harder. After being pooped out through a giant monsters sphincter you find yourself in the basement of the asylum, this is where the games takes a massive shift. The camera moves from being a top down puzzle adventure game to a first person perspective and it’s at this point where you start to notice the graphics of the game. From the top down perspective the graphics don’t really seem to great however once you start looking through Doug’s eyes you notice some smaller things in the game. This was a great way to use the shift in perspective because there are things that you can only see through Doug’s eyes at this point such as items on the middle shelf or a piece of information written on a notice board. You really do start to get immersed when this happens because of some deep dark whispering that is always in your ear! The story progresses with a mysterious serum that the doctors are using on the patients which has to have something to do with why everyone is either dead or turning into a giant crazy mutant. The sound from the game can sometimes be a bit lacklustre; there are some good sounds once you hit the basement but before that you really do only hear the sound of your footsteps as you run through the hallway which get frustrating quickly but once everything starts whispering in your ear it gets a lot better and a lot more creepy. The aesthetic of the game from the start isn’t too bad, the lack of sound didn’t really help to be honest but by the third level I was in! The game does a great job at using the view shift to its advantage after a few blood written messages and your interaction with the Characters which I must admit, could be a little better. The puzzles can get a little messed up at times but not in a negative way, just in a creepy, out of your comfort zone kind of way. There was one puzzle that I recall where you needed to follow the actions of a suicidal person and almost hang yourself from the ceiling light, but this only helps with the immersion and also makes you ask you why you did that and if it was the best way to achieve your goal. Though there is a checkpoint system, in game death didn’t seem like that much of an issue until you find your arms being ripped off by a monster and then said monster beating you to death with your own arms! You do find that you learn a lot more about how the games puzzles work and that changes your perception of how you see each puzzle. It’s hard to put down in the words of a review, so you would have to investigate it for yourself. Characters in the game are rare to come by; a lot of the other people that you see in the game are dead, dying or will soon be dead (either by monsters hands or by you…using a lawnmower) but the people you do come across aren’t overly well written. 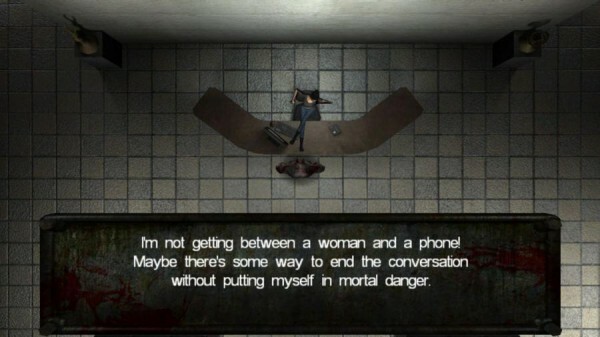 For instance you come across a man who is hiding in a dumpster in the first level who sounds insane, ironically, and some of the things he says just seem a bit too wild even for an insane asylum. Also a receptionist at the front desk who is working and on her cell phone the whole time doesn’t seem to care when a giant man covered in blood walks from Isolation into the lobby which is a bit odd. That being said Doug is written very well and he doesn’t seem overly crazy until you also join in with the killing. The inner monologues that Doug has when interacting with things is very interesting. For example I walked into room where there were a lot of dead people on the floor and upon investigation Doug calmly said “It’s like a party, with Dudes, no Chicks and everyone is dead” and I did find myself having quite a chuckle. In conclusion I think that Blackbay Asylum is a welcome addition to my Steam library and hearkens back to the days of top down action adventure, with a touch of horror, and some first person puzzle games which is terrific. At £14.99, or $19.99, I do think its slightly pricey at the moment but having said that they are a new developer and I am eagerly anticipating their next project. This entry was posted in Uncategorized and tagged Blackbay Asylum, Indie, PC, Steam, TAD Productions AB. Bookmark the permalink.